Set in land where common physics apply, but everything else looks different. You are Tiny, a technophile guy with a ray cutter, a gripping-device and a fine attitude towards the world. But now your nemesis Big again stole the only heritage your grandpa left you: A nice pair of white, fine rib underpants! And he's surely up to no good, why else would he take them to that forsaken desert... Where noone goes! So load up that selfmade raygun and rope device (snitched from the local hardware store) and take your annoying and jabbering backpack to accompany you. It's always been good use to your gramps. Besides, the robot taxi to the desert is waiting! Run, jump, drag, shove and laser your way through the ultimately ancient scenery, gain back those underpants! Unique Hand-drawn Look - all hand-crafted textures, primo Hatch Shading, and dynamic Sound Words puts you right into a graphic novel! Creative Jump 'n' Slice Gameplay - use grappling rope, rocket science and laser surgery to slice the whole world, overcoming all obstacles in your very own way. Enjoy unlimited slicing freedom and unique sandbox gameplay! Better than Life Physics - experience believable physics in a completely destructible, immersive environment that has been built to be cleaved into beautiful, multi-core-simulated pieces of art! 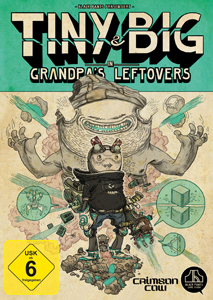 Character-driven Story Line - follow Tiny into a weird and humorous story drenched in peculiarity: get back grandpa's underpants, by all means necessary. Defeat Big, your old arch enemy in the process! Buckets full of Indie Music - collect more than 15 songs from hardly known but genuine indie bands. Discover new songs from the underground, and show off to your friends!